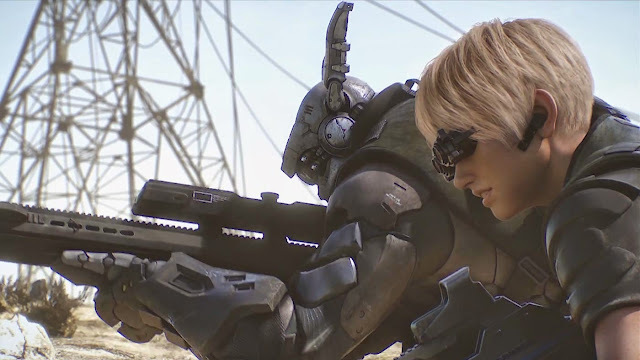 Set in a post apocalyptic world where apparently it is OK to cobble together thin gaming clichés within something that looks like a game and expect us to accept it is as a film, Appleseed Alpha is hard to justify. The plot reads like a game, unfolds like a game, has world mechanics like a game and looks like a game and yet, it has the temerity to not let us play, to instead expect us to spend ninety-three minutes watching an unskippable cut scene. Some of the background CGI work may be decent but the fact remains that Appleseed Alpha's uncanny valley visuals look more at home on a Playstation than in Leeds Town Hall. Where similar productions - The Polar Express is the easy example to call from - have the advantage of having a distinctly non-videogame plot, director Shinji Aramaki, long involved with the Appleseed saga, has no such luck. Following two mercenaries - Deunan and Briareos - the episodic plot initially sees them completing tasks for local gangster Two Horns before a young girl, Iris, shows up to switch their focus. The videogame clichés keep rolling. David Matranga sounds like David Hayer, the voice behind Konami's Metal Gear Solid hero, Solid Snake. Deunan, a young lady, is garbed in traditional female videogame dress, which is to say that her combat suit is in sharp contrast to Briareos' with how much 'skin' it is willing to reveal. The actions sequences look good but make little sense, at least one character surviving several apparently fatal episodes with limited explanation. There's exceptionally little going on here, even if you can look past the surface inadequacies. The post-apocalyptic setting has little information and would-be philosophical discussions of a potential eden are cut short or unexplored. Perhaps they are being saved for the sequel and it is only fair to point out that this is the third in a series, the first two of which I have not seen. With what this offers as a stand alone piece though, I rather suspect the extra context would contribute little to the overall quality. Have you seen Harlock Space Pirate? It's another Shinji Aramaki offering but I thought it was so much better than Appleseed Alpha. The CG animation is stunning and I found the plot much more enjoyable! I've not seen that no. In fairness to Appleseed, this isn't really my genre, but I happened to be at LIFF on their Anime Day so thought I'd give it a shot. Saw some good stuff too, but just didn't get on with this.